Each day there are more and more Internet sites that are dedicated to online video storage, but the vast majority of the websites don't allow you to download these videos to your hard drive to enjoy them when you don't have an Internet connection available. To be able to manage this you can use RealDownloader. All you have to do is visit the website on which the video that you want to download is stored, and a button will appear to be able to download it very quickly and without any complications. RealDownloader also offers you the possibility to select in which folder each video is stored. 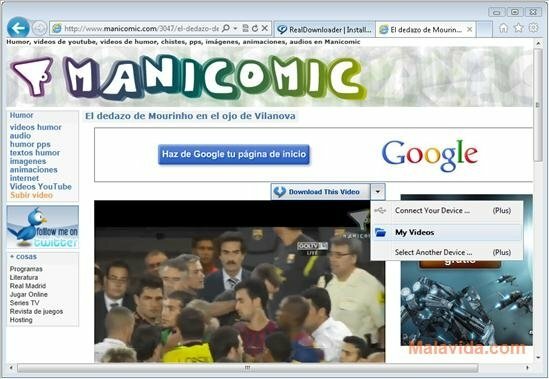 The easiest way to download videos from the Internet. 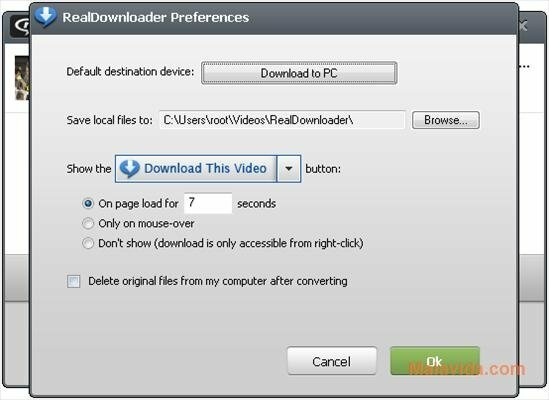 Other options offered by RealDownloader are the possibility to share the downloaded videos on the most important social networks (Facebook, Twitter...) or to see the video once it is downloaded by simply clicking on the video. Therefore, if you want to enjoy your favorite Internet videos on your computer, all you have to do is download RealDownloader.